Besides a modest electric guitar collection,I also provide some services. Already 20 years I'm a (valve-)amplifier hobbyist/ repairer.I've my own little firm " ROCK !" where-in I'm trying to repair those old amplifiers.Most of them are from Juke-Boxes,and I can say : I've seen them all !There're amp's I've repaired for Belgium;The ,but lately they're surfacing and I'm tNetherlands;Germany;France,Switserland;Sweden and last but not least : USA ! For the moment I'm repairing a Dynacord DA12(1958)amp,who's vibrato-electronics have been cutt out.But I'll get this amp in original working order again!!! !...and since it's already a year ago : now it's again in working order and often used ! Shown here's an example of an amplifier I repaired(better restored in it's original state). It's much better to be able to work on an amp with the schematics nearby.But one doesn't have them always arround,so I draw a new schematic according the amplifier.Once the amp is working,the schematic can be completed with a tension chard. It isn't always easy but all those years of experiance and all those amp's I've seen inside-out do help...so many amp's...so many different faults couldn't get me down ! Hereby an example of how I repair JukeBox amplifiers. After years I developed a new,modified circuit board for the Wurlitzer 530-536 amplifier,used in the Wurlitzers 1900-2400. Upon request I can repair the original circuit board in its original state(if not too much damaged !). On the photo you can see the original brown pertinax circuit board whith it's original components;there under the new circuit board who's easely interchangable.Together with a new power supply circuit board(W536) a W536 amplifier takes only three to four hours to be repaired! Of course the other components such as the 6L6 valve bases need to be replaced too, the volume potmeter; the cancel switch; the power switch; the power cord etc ... So your amp comes back as new to your home and his (jukeBox-)housing! 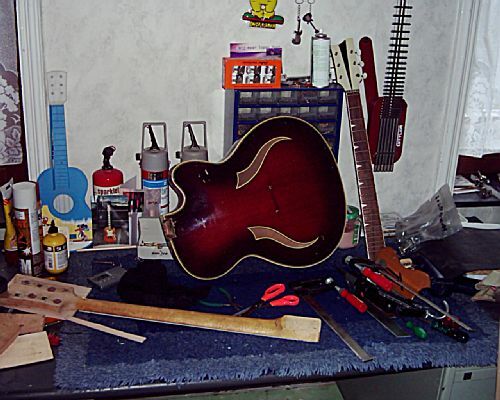 look at my workbench.many guitars passed here to be repaired. Others where taken apart to determine wich brand and/or wich hardware they used. You see a East-German semi-accoustic to be repared.This "Hemosch"guitar was complete but in such a dirty state it had to be dismanteled,and rebuild from zero! found recently a Hüttl electric guitar with build-in amp.This guitar must be from late 70's or beginning 80's due to the SN76007N amp(dated 11 week from 1979).Since there's no info available about this guitar and/or the amp I'm still researching this brand.If anybody can give me some info about this 555 Folkamp Hüttl(made in Germany)please do !